It’s morning and you are enjoying a nice hot cup of coffee and you suspect you hear something in the attic above your head. You turn down the news and then there’s nothing. A few days later the same thing happens so you tell your spouse that you’ve been hearing noises in the attic. They glance up in the attic, but everything appears as normal and they haven’t heard anything strange, so the sounds are attributed to the house moving and settling as the temperatures outside change. Two weeks later you hear scurrying and a full-blown ruckus above your head. You have a problem. You have an animal intruder! Scenarios like this one are common during the months of April and May and are most likely attributed to squirrels. Female squirrels often use attics, chimneys, soffit areas, and gutter lines as nest sites and dens to raise their young. Squirrels are active during the day and sleep at night so noises from a family of squirrels are typically heard throughout the day. Tree squirrels breed twice a year (December-January and May-June) with 1-7 young being born in February-March and July-August. 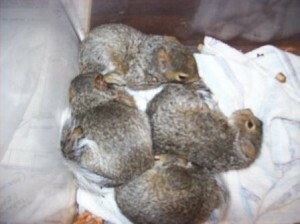 Juvenile squirrels become active as early as six to seven weeks making their presence known to homeowners. Like many young children the normally quiet mother can’t keep her litter quiet and they can often be heard scurrying, scratching, and even barking from their living quarters. 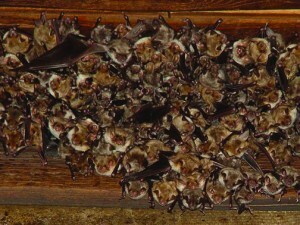 Tri-State Wildlife Management must take extra precaution when excluding squirrels out of attics and other structural voids to make sure there aren’t any juveniles trapped inside. Juvenile squirrels removed from local home. 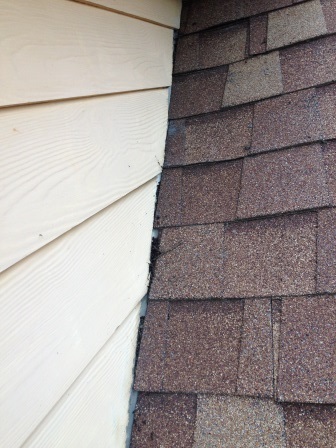 Since squirrels are rodents and are notorious chewers they can cause a lot of damage to a structure. Although, squirrels prefer to chew on wood they are also known to chew on electrical wires. For this reason, it is imperative that squirrels are removed from a structure. Tri-State Wildlife is your squirrel removal specialist in the Northern Kentucky and Cincinnati Tri-State area. It is our responsibility to provide our customers with a comprehensive service which includes, trapping and removal, exclusion and repair, as preventative services. If you suspect that you have a squirrel issue call Tri-State Wildlife today 859-635-0037! We are confident that you will be satisfied with our work! Bat Removal and Repair Kenton County – Bats Series Part 3: Damage and Damage Identification Tri-State Wildlife Management continues to receive many calls from people in the Tri-State area who are realizing bats are taking up residence in their home or business. 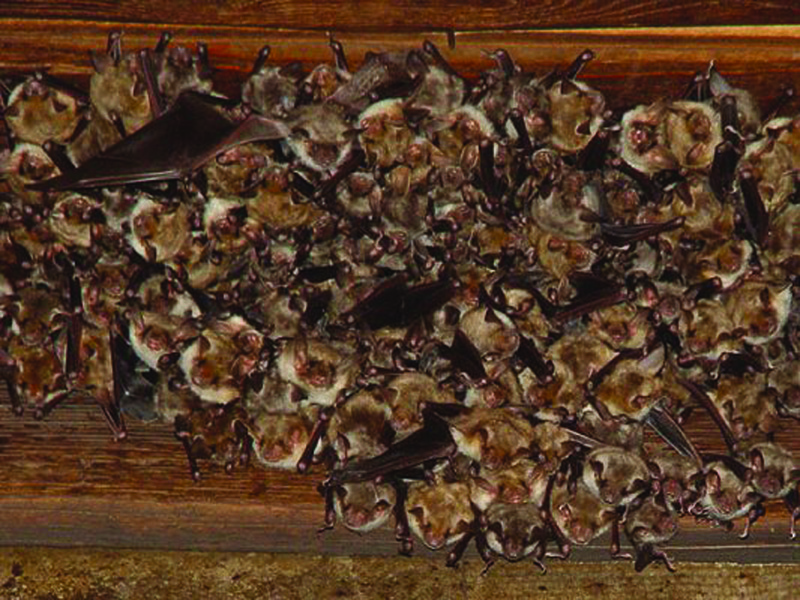 This is also the time of year when the technicians at TSWM are able to exclude bats, repair damages, and prevent re-entry on homes and other structures. 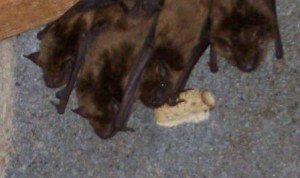 Bat Removal and Repair Kenton County – For Bat Removal and Exclusion Services Northern Kentucky, call Tri-State Wildlife Management at (859) 635-0037.